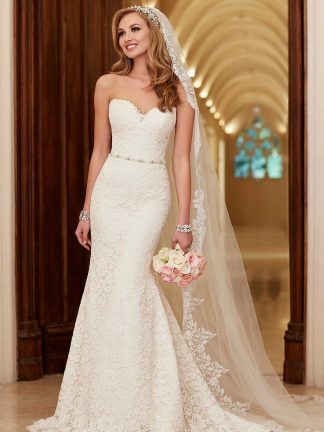 Stella York lace trumpet wedding dress features lace and tulle over lavish satin. 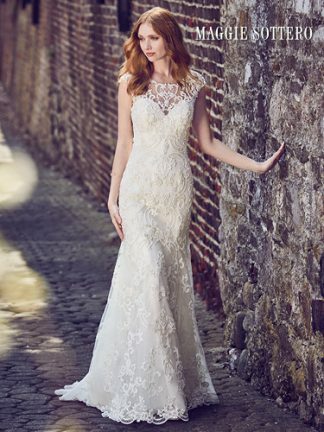 Stella York lace trumpet wedding dress features lace and tulle over lavish satin that creates a sleek silhouette. A soft organza back which flows into a stunning train with a scallop lace edge finish for a truly romantic walk down the aisle. A deep sweetheart neckline, lace straps that create a comfortable, a zipper closure is hidden under fabric-covered buttons.